Left by her parents to fend for herself at a residential school for poor children when she was just five, this was probably the best thing that happened to Jyoti. One of seven siblings, she showed no signs of heartbreak at being abandoned by her family. Instead, she displayed surprising maturity at that young age and understood that this was her big chance to do what she wanted the most — to study. So, unlike other girls of her age, Jyoti did not run away to escape the rigours of the spartan life there. She embraced life at the ashram and used the opportunity to improve her knowledge and skills. Little did she know that this wisdom and resilience would help her become a Member of the Legislative Assembly (MLA) of the ruling Janata Dal (United) [JD(U)] in Bihar. However, not many know how Jyoti was catapulted to the political centre-stage. As we celebrated the 129th birth anniversary of B R Ambedkar, the father of the Indian Constitution on April 14, it is also time to laud the achievements of the unknown and unheard Dalit women, who overcame caste barriers with their courage and determination to fulfill their dreams. The Musahar community in Bihar is one of the most deprived and socially disadvantaged groups in India. Literacy rate in this community is just 9.8 per cent, the lowest among Dalits in the country. Only about one per cent of the Musahar women is literate. The couple began classes under a tree until the village gifted some land. The community pitched in by donating labour for the construction of a modest building. Since then, all children go to school. In fact, 10 neighbouring villages were so inspired by this community effort that they, too, got together to do the same. When the State Government opened a primary school and an anganwadi in Fatehpur block in Gaya, Jyoti was the natural choice as an anganwadi worker, being the only active woman from the community. She not only inspired women to bring their children to the anganwadi, she was also able to debunk several myths related to maternal and child health. Realising that the lack of information held back Musahar women from immunising their children, Jyoti said she first got her own children vaccinated and then asked other women to follow her example. Realising that women’s empowerment was the key to improving maternal and infant health, she began organising them into self-help groups (SHGs). Over the next 10 years, the number of SHGs increased from 10 to 350. Besides motivating them to stand up against violence, both within and outside their homes, she trained them to look after their own health, using a new farming technique, a system of rice intensication or SRI, after learning it from Pradan, a not-for-profit organisation working with the community. It was Jyoti’s success in turning vast barren lands into green belts with the SRI technique and other indigenous methods that caught the attention of Chief Minister Nitish Kumar. And it was these efforts that contributed to her victory in the polls — she defeated her opponent by a margin of over 24,000 votes. Although she did not contest for a second term in 2015, Jyoti did not let her experience as MLA go waste. She continues to work for the community and inspire other women. Just as Phoolmati is doing in Nebua Naurangia, a remote block in Gorakhpur district in neighbouring Uttar Pradesh. Here, she is empowering women in her Dalit community to stand up for their rights. One of the big changes that she brought about was motivating women in this backward block to launch an anti-liquor agitation. Their determination and courage in standing up against the powerful lobby that promoted alcohol bhattis (small-scale production units) led to the closure of such units. The women overcame their fear of a backlash from upper caste men running these units, thanks to their collectivisation as SHGs facilitated by Phoolmati. She has single-handedly helped the formation of over 50 SHGs in the block. 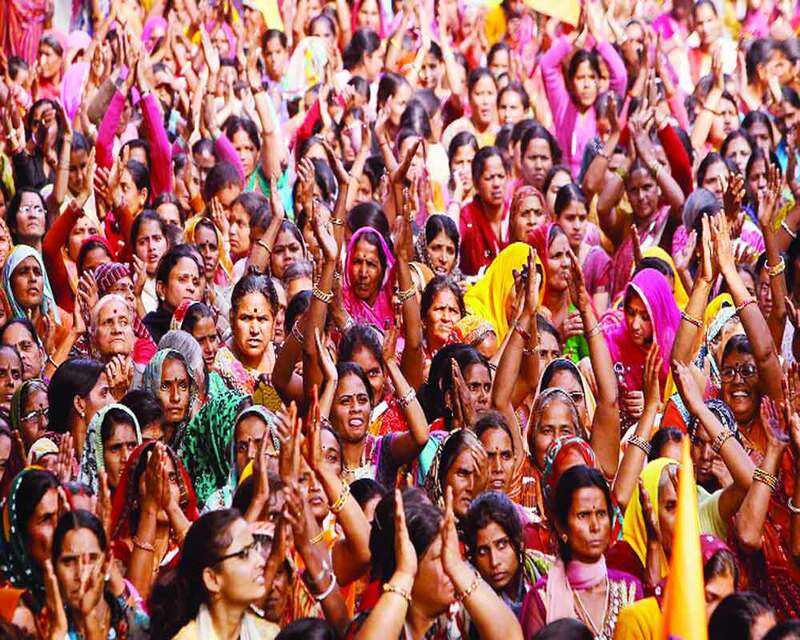 This is why women here have come together to demand roads and demonstrate in front of the district magistrate for employment under MNREGA, the Government’s national rural employment guarantee scheme. Phoolmati has also inspired confidence among women in the community to stand up against violence. Women are ready to file complaints against perpetrators, including their husbands. In a State where patriarchy keeps women closeted in their houses and violence against women is the highest in the country, this is a big step. Statistics reveal that between April 1, 2017, and January 31, 2018, there was a 25 per cent increase in rapes, 40 per cent rise in incidents of molestation, 35 per cent jump in cases of kidnappings of women and a 50 per cent increase in cases of eve-teasing, compared to the corresponding period in 2016-17. Not just in violence, Uttar Pradesh has another dubious distinction. Here one in every five girls is a child bride. Phoolmati was one of them. Married young to a much older man, Phoolmati managed to study only till Class V. When she got a chance to learn about her rights and entitlements after becoming a SHG member, thanks to the Rajiv Gandhi Mahila Vikas Pariyojana, a not-for-profit working for women’s empowerment, she decided to share this with other marginalised women. She has helped over 750 women step out of their houses and transform their lives with the help of knowledge and training disseminated through the SHGs. But for Choti Bai, a resident of Chittorgarh district in Rajasthan, realisation of her rights came late. It was only after 22 years of cleaning toilets with her bare hands that she discovered manual scavenging was illegal. This was in 2008 when she met activists of the Rashtriya Garima Abhiyan (National Campaign for Dignity and Elimination of Manual Scavenging), a coalition of 30 community-based organisations from 13 Indian States, working to improve the lives of these marginalised communities. Once Choti Bai decided to give up manual scavenging, she braved opposition from her husband and mother-in-law. She turned to work as a daily wage labourer in the fields and took to sewing clothes. When campaign activists saw her determination, they asked her to work with them. In 2012, she joined the campaign as a motivator, earning a monthly salary of `1,700, far more than she ever earned as a manual scavenger. Her new life has brought her dignity and respect, especially from those who once considered her untouchable. She has helped persuade 112 women working as manual scavengers in her district to give up this work. While some of these women have been helped to start a small poultry business, others have been helped to get job cards under MNREGA. Now, thanks to Choti Bai, there are no more female manual scavengers in her village. This is a big achievement considering in India, manual scavengers are mostly women. Men from this community clean septic tanks and sewers. The Socio-Economic Caste Census of 2011 counted over 1.82 lakh families that had at least one member employed in manual scavenging. Changes being brought about by women like Choti Bai, Phoolmati and Jyoti need to be recognised and celebrated. They have broken the shackles of caste and patriarchy and reclaimed their rights, especially to live with dignity.